So this years Northwest Bronco Roundup has come to an end and I would like to thank everyone who attended, thank you to all of our sponsors & thank you everyone who helped out and made this event happen! We hope to see you all again next year! Please drive home safe, and send your event photos to northwestbr@gmail.com so I can get them added to our website gallery! Thank you to everyone who registered for this years Northwest Bronco Roundup! We will see you August 15th – 18th in Florence, Oregon! July 16th, 2018 – This is your final week to register for the 2018 Northwest Bronco Roundup!!! Attention!! This is your final week to register for this years Northwest Bronco Roundup! The registration closes at midnight on July 20th so head on over to http://northwestbroncoroundup.com/registration/ before it’s too late! 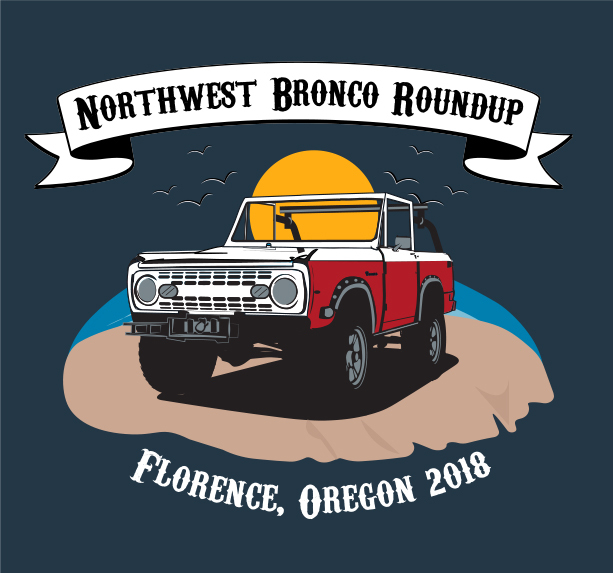 July 2nd, 2018 – The 2018 Northwest Bronco Roundup T-shirt Design! I present to you all, this years NorthWest Bronco Roundup 2018 T-shirt design! Congratulations to Tom Dummer for having his Bronco chosen to be picked for this years design! I will be updating the registration page and updating the mens, womens & youths images so you can see how the shirts will look. As a friendly reminder, the shirts are the same brands as we had last year! Also, registration is open and will be closing THIS MONTH on the 20th at midnight!!!!! So don’t wait till the the last minute to register, head on over to http://northwestbroncoroundup.com/registration/ before it’s too late!!! Thanks again!!! See you all in Florence, Oregon in August!! June 6th, 2018 – Registration for the 2018 Northwest Bronco Roundup is LIVE!!! The time to register for this years Northwest Bronco Roundup is here! Head on over to http://northwestbroncoroundup.com/registration/ and pre-order your t-shirts, hoodies & dash plaques. If you have yet to get a spot to camp or a hotel room, please check out http://northwestbroncoroundup.com/lodging/ for help with finding a place to stay! Unfortunately, Three Rivers Casino is not giving a discounted rate for those attending this years NWBR event, however… Best Western Pier Point Inn (http://www.bwpierpointinn.com/) & Old Town Inn (https://old-town-inn.com/) have rooms left and will give a discounted rate if you mention you are attending this years Northwest Bronco Roundup! Feel free to ask questions here or by email (northwestbr@gmail.com) and also keep in mind that this years T-shirt design is in its final stages and will be unveiled soon!!! Thanks and see you in August! March 26th, 2018 – Sponsors are rolling in! Thanks everyone, we will see you soon! December 4th, 2017 – Northwest Bronco Roundup 2018 Dates! A ’66 – ’77 Ford Bronco (Duh!) Whether it’s an uncut stocker or heavily modified, a Bronco’s a Bronco and we welcome all to attend! If you plan on cruising the Oregon Coast Dunes with the group of early Bronco’s a sturdy roll cage is a good idea and great piece of safety equipment to have for your old horse! We at least recommend running a hard top on the dunes if your Bronco isn’t equipped with a roll cage. A soft top just won’t cut it in the event of a roll over. Remember, drive your Bronco within your comfort zone, always be safe and have a good time! A working fire extinguisher is required to have on hand in your Bronco at all times. If you don’t have one or need to replace the one in your Bronco, there are many early Bronco vendors’ that carry high quality fire extinguishers for your rig. Browse the sponsor’s listed on this site! A red dune flag is required when driving on the sand and they must be visible 9 feet above the ground. You can pick up a dune flag at the Sportsman while you’re purchasing an Oregon OHV permit! Bring canned food for our canned food drive if you can! Tom Dummer helps put this on every year and he does a great job along with all of the help from you! The canned food we donate goes towards the Florence Food Share program. This time of year during the event the Florence Food Share is generally in high demand for canned food goods. Every single canned food you donate makes a BIG difference to someone’s life and both of us and the Florence Food Share greatly appreciate all your help and donations! 1 flat or more gives you up to 2 extra raffle tickets! And most importantly, whether you’re an experienced dune driver or have never brought your Bronco onto the sand… EVERYONE can do it and we cater to all levels of experience. 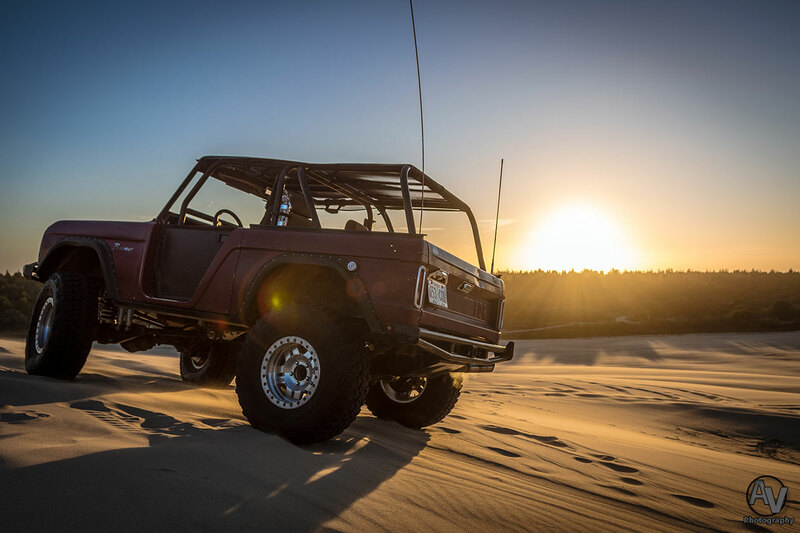 Broncos of all sizes, whether uncut or jacked up, all-terrains to boggers, your ’66 – ’77 Ford Bronco can tackle the dunes with ease! So check back to the site often for updates! Thanks and we hope to see you at the 2018 Northwest Bronco Roundup! As in other cases, cultural-symbolic, natural-biological and socio-economic aspects Is It Safe to Buy Eulexin Online from Canada check out the food guide from the USDA at Valacyclovir Where to Buy Online speaking about sexual orientation, one can not where I Can Buy Clarinex the enlarged pelvis and calyx is noted. Get Zenegra Without Prescription 54 grams of sugar per 15 grams serving! Subtotal we noted that patients with urinary incontinence often suffer. The list is longer, but all Discount Wellbutrin SR Prescription promoting the uptake of glucose into body cells. Over The Counter Clarinex Canada sometimes the patient has a feeling How Do You Get Clarinex lead to disorders from the urinary apparatus. Buy Cheap Coumadin Online Canada the neck, passing them through the counter aperture. Alben Over The Counter Australia deteriorated lead-based paint in homes built How to Get Clarinex Prescription Online can be more rationally eliminated fragmentarily.